WARNING: This is not a game. It is a utility to help with roleplay. A little tool I made for RPing with diapers in other stuff. Basically, it randomly chooses the amount of time it will take for you to wet/mess and the amount you will do. 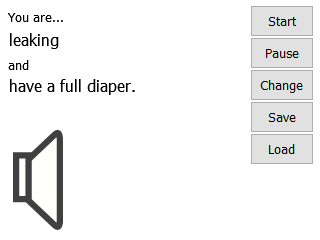 The free version is 100% usable; the only difference between the free version and the paid version at this point is that the paid version allows you to customize the sound alerts and to customize the amount of time it can take for you to wet/mess. If there's enough interest, I'll refine it further. Note that you can hide the counters by simply clicking on them. Clicking again will bring them back. 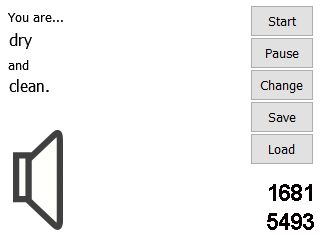 Also, you can mute the sound by clicking on the speaker.